Magnesium Deficiency Reduces Effectiveness of Vitamin D in the Prevention of Disease. Magnesium deficiency is an important factor in the results obtained from vitamin D. According to Dr. Carolyn Dean, MD, ND, magnesium expert and Medical Director of the nonprofit Nutritional Magnesium Association (www.nutritionalmagnesium.org), the effectiveness and benefits of vitamin D are greatly undermined in the absence of adequate levels of magnesium in the body. Magnesium acts with and is essential to the activity of vitamin D, and yet most Americans do not get their recommended daily allowance (RDA) of this important mineral. Extensive research has shown that vitamin D deficiencies play a major role in the development of dozens of diseases, including a variety of cancers, such as breast cancer, prostate cancer and colon cancer, as well as diabetes, heart disease, arthritis, osteoporosis, psoriasis and mental illness. “While many people are beginning to realize the amazing health benefits that vitamin D has to offer in the prevention of disease, they may not be getting the full benefits from vitamin D without also supplementing their diets with magnesium, which is a vital nutrient that works synergistically with vitamin D,” says Dr. Dean. “Adequate levels of magnesium in the body are essential for the absorption and metabolism not only of vitamin D but of calcium as well,” Dean states. “Magnesium converts vitamin D into its active form so that it can help calcium absorption. Dr. John Cannell, Executive Director of the nonprofit Vitamin D Council, concurs with Dr. Dean’s findings, recognizing the importance of magnesium as a nutrient that is required for proper vitamin D metabolism, while additionally citing several studies that illustrate this point. Magnesium influences the body’s utilization of vitamin D by activating cellular enzyme activity. Enzymes are protein molecules that stimulate every chemical reaction in the body. All the enzymes that metabolize vitamin D require magnesium. Magnesium has a possible role in vitamin D’s effect on the immune system. Several studies related to bone health published in the Journal of Physiological Biochemistry and in the Clinical Nutrition journal point out that magnesium is also necessary for vitamin D’s beneficial actions on bone. Since pathologists first began examining the heart, they realized that a connection existed between deposits of calcium and heart disease. Vitamin D inhibits calcium deposition in arteries, and magnesium converts vitamin D into its active form so that it can prevent calcium buildup in cholesterol plaque in arteries. The combination of magnesium and vitamin D helps prevent clogged arteries by drawing calcium out of the blood and soft tissues back into the bones where it is needed to build healthy bone structure. 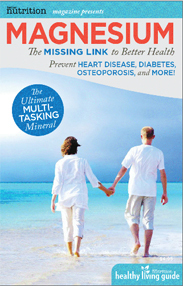 A 32-page guide to the benefits of magnesium, along with magnesium deficiency symptoms, written by Dr. Dean is available as a free download at www.nutritionalmagnesium.org. The nonprofit Nutritional Magnesium Association (NMA) is a trusted authority on the subject of magnesium deficiency and the benefits of nutritional magnesium for a variety of health issues. Radio, TV, magazines and professional journals interview its members regularly—including ABC, NBC and CBS. The mission of the Nutritional Magnesium Association is to disseminate timely and useful information on the subject of nutritional magnesium so as to improve the lives of all people affected by the widespread magnesium deficiency in our diets and the related health issues associated with this deficiency. For more information, go to www.nutritionalmagnesium.org.